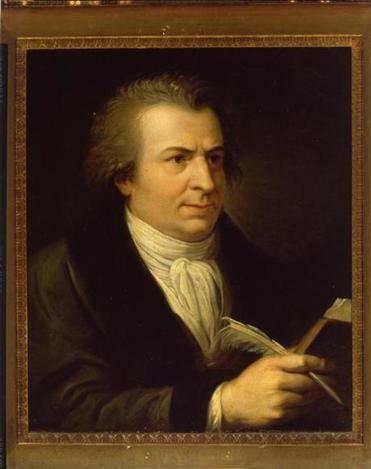 A portrait of Giambattista Bodoni by Andrea Appiani, from “Giambattista Bodoni: His Life and His World” by Valerie Lester. More than 200 years after the Bodoni typeface was created, it remains ubiquitous — appearing on the cover of Vanity Fair and in books and newspapers. Now Hingham author Valerie Lester has produced a first-rate, lushly illustrated biography of the creative genius who came up with the font, “Giambattista Bodoni: His Life and His World” (Godine). Born into a family of printers, Bodoni surpassed them all, at a time when printing was a craft held in high esteem. Hired by the duke of Parma, Bodoni at age 28 became director of the royal printing operation in 1768. He worked quickly and precisely, designing fonts in many languages and alphabets. After his death in 1813, his widow, Ghitta, completed the two volumes that catalog his prodigious output. Lester first heard of Bodoni when a friend mentioned that he had unwittingly bought a stolen Bodoni book. Lester, whose previous books include a biography of Hablot Knight Browne, an illustrator of Charles Dickens’s works, grew curious about Bodoni. She steeped herself in the turbulent politics of his time and sought out foods he may have dined on. In “Second Nature: An Environmental History of New England” (University of Massachusetts), Richard W. Judd chronicles how nature and humans have reshaped the region over the past 12,000 years. He offers high praise for the environmental successes of the 1970s, including the protection of rivers and coastline and the preservation of pastoral landscapes in the face of development pressures. Popping up periodically throughout the book are mentions of writers — such as Robert Frost, Sarah Orne Jewett, Celia Thaxter, Henry David Thoreau — who have preserved in print quintessential New England settings. A recurring theme in their works is the conflict between the concerns of country and city folk, business and nature. In Frost’s poem “Christmas Trees,” a farmer rejects a merchant’s offer to buy and cut down the pines in his pasture. In Jewett’s short story “White Heron,” an ornithologist offers $10 to a country girl if she will guide him to a heron’s nest. After wrestling with her conscience, she declines, unwilling to risk harm to the heron. “Second Nature” is the winner of the New England Historical Association’s James P. Hanlan Book Award. Judd is a professor of history at the University of Maine. The award recognizes excellent work by a historian who lives or works in New England.